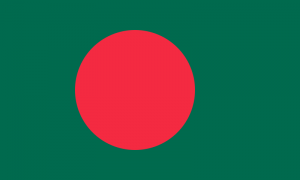 The official name of Bangladesh is People’s Republic of Bangladesh, in Bangla or Bengali – গনপ্রজাতন্ত্রী বাংলাদেশ। It is a small country in south Asia. The east, west and north of Bangladesh are bordered by India and a small border with Burma (Myanmar) to the far southeast and by the Bay of Bengal to the south. The borders of present-day Bangladesh were established with the partition of Bengal and India in 1947, when the region became East Pakistan, part of the newly formed nation of Pakistan. However, it was separated from the western wing by 1,600 km (994 mi) of Indian territory. Due to political exclusion, ethnic and linguistic discrimination, and economic neglect by the politically-dominant West Pakistan, popular agitation grew against West Pakistan and led to the Bangladesh Liberation War in 1971, which the Bengali people won against Pakistan and new country Bangladesh born. Today, Bangladesh is a secular, democratic republic. – Declared on March 26, 1971. Official Language – Bangla or Bengali and English.